My name is John. I am a graduate of Management Information Systems at Iowa State University, and this is my web site. This is basically a place where I can post stuff on the web when I feel the need and a place for me to experiment with computers in a semi real-world application. 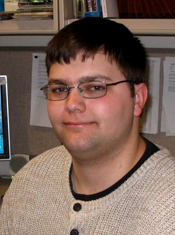 I work as a web developer at the College of Agriculture and Life Sciences at Iowa State. This site is run on Drupal CMS using Apache, MySQL, and PHP hosted on Dreamhost. Over the years I have been learning the LAMP architecture by creating custom applications for this site. I am not a Linux / Open Source evangelist though. Most of the UNIXes out there are not what I like for being productive. For everyday work, I use a Mac. I am interested in user experience and Apple seems to get it right. If you are wondering why bobbis.net, I will explain. You know how people use John Doe for a generic or unknown name? I like to use Bob Bobbis. It's mostly for the generic meaning. This is a very generic, not very well-known web site, and I don't expect it to be. It's a perfect fit.